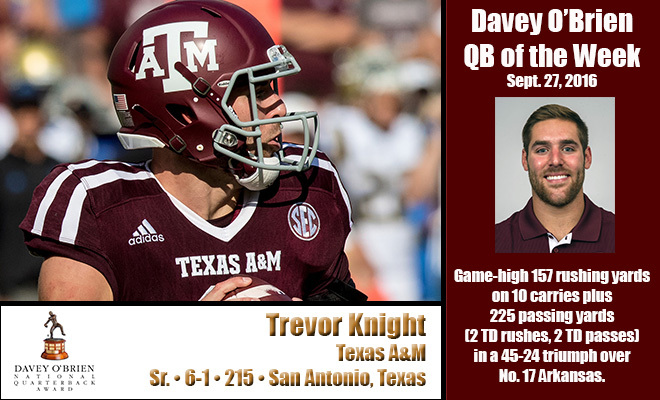 FORT WORTH, Texas (Sept. 27, 2016) – Texas A&M senior Trevor Knight has been named the Davey O’Brien Quarterback of the Week, the Davey O’Brien Foundation has announced. In a 45-24 win over 17th-ranked Arkansas on Saturday, Knight rushed for a game-high 157 yards on 10 carries and a pair of rushing touchdowns. In addition, he passed for 225 yards and two scores. Knight, who has been a “Great 8” quarterback in consecutive weeks, ranks 15th nationally in total offense (340.8 yards per game) and tied for 16th in total points responsible for (72). He is one of two FBS players with more than 1,000 yards passing and 300 yards rushing this season. In his first year at Texas A&M, the native of San Antonio, Texas, has helped the Aggies to a 4-0 start and a ranking of ninth in this week’s AP Poll. All FBS quarterbacks are eligible for the weekly award, which is determined by a subset of the Davey O’Brien National Selection Committee. The other “Great 8” quarterbacks in week four were: Joshua Dobbs of Tennessee, Louisville’s Lamar Jackson, Daniel Jones of Duke, Ole Miss’ Chad Kelly, Colorado’s Steven Montez, Mitch Trubisky of North Carolina and Arizona State’s Manny Wilkins.